So I put it back indoors now and still nothing although it seems fairly alive y but nothing in terms of sprouts , only leaves. Thanks in advance if anyone is experienced with hibiscus' , should I fertilize ? Last edited by jrmtl on Fri Mar 23, 2012 5:02 pm, edited 4 times in total. Hibiscus plants flowers in full sun and they like water so water them regularly. They also need less fertilizers. They require full sun because excessive shade will reduce flower production. They do not like being shifted so make sure you pick the right plant and the right spot! Try placing it outdoors, it might help. I just put it back inside as it didn't like being outside in full sun , it was dying and leaves yellowing. Now back inside looks better but no flowers at all. Should I do anything else ? Or just keep watering normally or even maybe prune it? If the leaves are turning yellow and dropping off, it's getting too much water. Hardy hibiscus is really not suited for pots and since they will come back every year they really do not have to be protected in the winter. It also said that the tropical hibiscus usually only lasts healthily 4-5 years in a pot. Hibiscus will not flower until the temperature is consistently above about 55 to 60 degrees F. If the temperature is around or below 55 all the time, the foliage will grow, but the plant will not bloom. Below about 40 F, the foliage starts dying off. And, freezing or below temperatures will kill it. Your plant would probably enjoy being moved outdoors in the summer, but you shouldn't put it into direct sun right away. It needs to be hardened off, or it will get sunburned. Did you harden it off when you moved it out this year? Sunburned leaves will dry and fall off, so that might have contributed to the difficulty you're having. Also, it looks like the plant gets good light where you have it located. I'm guessing that you closed the blinds on the one window to facilitate taking the photo. Right? Did you change your watering schedule while you had it outdoors? Have you fertilized the plant? If you have fertilized it, you want to use a product with more phosphorus and potassium than nitrogen. Check the N-P-K numbers on the label of the fertilizer you bought. Nitrogen is the first number, so you want the second and third numbers to be higher. I think I did not harden it after taking it outdoors and it did get sunburned as you said as the leaves started wilting. It sure needs a lot of maintenance outdoors as it wilts after a day without water. It was doing terrific and blooming during the winter at same spot inside. Should I just leave it here till winter than risk it dying outside? Considering the cold winters in your location, I think it is a wise idea just to keep it indoors now. I'm curious whether it set any buds at all while outdoors. Do you recall seeing any? Since your plant will be protected indoors, you might give it one feeding of fertilizer. Mix it half the strength recommended on the label, or even weaker. Only fertilize if the plant is sending out new leaves to replace those that were lost. As the season moves into fall and the intensity of the sunlight weakens, your plant will need less fertilizer, because it won't be actively growing. Fertilizer contains salts, which if not used by the plant for producing new growth, can accumulate in the soil and burn the roots. If it isn't producing new growth now, hold off on the fertilizer. Thanks for all the tips and advice ... great site btw ! There were no buds outdoors as it seemed stressed. So I guess I will keep it in for now even though it's labeled as an outdoor plant. There are indeed new leaves growing in the middle of the branches so I will hold off on the fertilizer. So forget about this year summer outing for the plant as it didn't get acustom to the heat very well. Will just leave in pot and should I trim the branches from the picture ? You can trim it back when you bring it in for the winter. You don't have to water as much in the winter, but I do find my heat does dry it out quickly. Anyways the plant is in now for good but does it need a bigger pot ? If it is potbound you should probably uppot it. 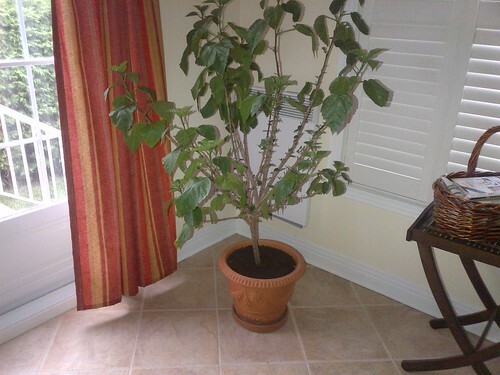 - I don't know if hibiscus will take root pruning to keep it in a smaller pot, so uppotting is a safer bet. But wait until it is over the stress and growing well again before you disturb it. A note on watering too - make sure the soil is well saturated when you water. Either by submerging it up to the rim in water for a while, or watering it a couple of times a few minutes apart, each time enough so it drains freely from the bottom. Then wait for the soil to go dryish before watering again. a potbound plant will need watering more frequently. It seems like my hibiscus is healthy again and has been blooming since I brought it indoors even during the summer. Here's a pic. One thing is that it's growing pretty big and I just wanted some advice on how to prune it and which stems to cut and whether I should wait till spring. 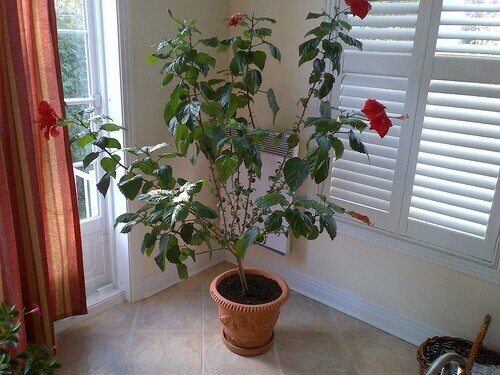 Just wondering how and when I should cut / prune my hibiscus as it's getting pretty big for the pot and my room. I just don't want to over do it .